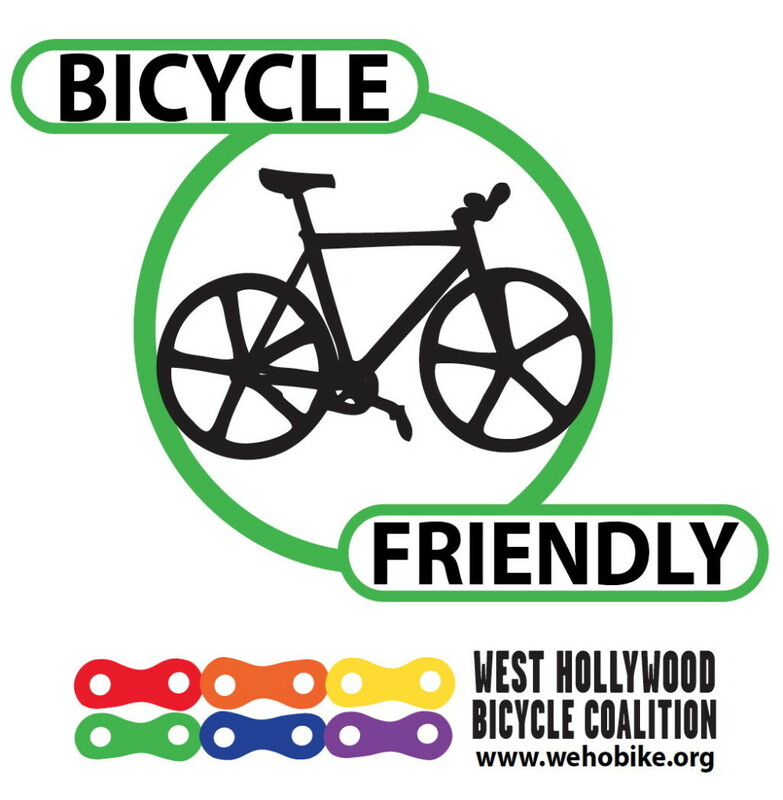 The West Hollywood Bicycle Coalition is reaching out to businesses to let them know about our efforts to publicly recognize bicycle-friendly businesses. We are grateful to the following businesses for their support of bicycling in West Hollywood — please visit them!! Target (Bike pump at the Customer Service area, water, employee bike lockers and showers), 7100 Santa Monica Blvd. West Hollywood Gateway (Bike pump at the security office, water fountain, employee bike lockers & showers), 7100 Santa Monica Blvd. Irv’s Burgers (water refills), 7998 Santa Monica Blvd. Surly Goat (water refills), 7929 Santa Monica Blvd. Bikes and Hikes (water refills, bike pump), 8250 Santa Monica Blvd. Astro Burger (water refills, secure bike parking for employees), 7475 Santa Monica Blvd. Whole Foods (water refills, secure bike parking for employees), 7871 Santa Monica Blvd. The Coffee Bean & Tea Leaf, (water refills, secure bike parking for employees), 8735 Santa Monica Blvd. City of West Hollywood (secure bike parking for employees, water refills), 8300 Santa Monica Blvd. Coffee Coffee (secure bike parking for employees, water refills), 1040 N Fairfax Ave.
Filth Mart (secure bike parking for employees), 1038 N Fairfax Ave.
Modern Rugs LA (15% discount, secure bike parking for employees), 629 N. La Cienega Blvd. Allow cyclists and pedestrians to refill their water bottles without charge. Accommodate employees who bicycle to work (such as secure bike parking, or lockers and/or showers). Provide discounts to either members of the Los Angeles County Bicycle Coalition or to any customer who arrives by foot or bike. Make a bike pump available for cyclists to use at no charge. In addition to being included on our website, bike-friendly businesses will be given a lovely, easy to move window decal.